2:09 sold 9 stop 14-got a 20/110 "hook and go"
looks like we are turning up, so I'm looking for an entry point. 1:26 trading a spike low like this takes experience, so if you try it, be careful. Our normal rules are for all, including newbies. the top of the first big bar, let it go. 11:24 if you find the down diagonal yellow line off the high and the up one off the low, you see a converging triangle. 11:05 the MoonTides forecast the shape of the 110 minute EXMA. Note that the Upper 110+4.5 points is following the red -Tide. But we have dropped to the lower green +Tide-the two form a MoonTide Fractal Set. 11:01 OK, the 5 points was there. No regrets at not getting it all. Only pigs try for that. They become bacon. 10:46 being attracted to the Mercury Magenta M flux line 10:44 stop to 17-tell myself "I got my second 25 grand." how they fit in with my stuff. 5/2/2008 12:04:11 PM Mountain b:: Thank you. I will read about it. Looking at the clinic chart, would you anticipate the market moving up to sideways until pass the purple line? And then a rally to close if it continues to follow the same moon line? I am trying to fix my eyes on what you are discussing in the clinic. Thanks again. 5/2/2008 11:44:31 AM Mountain Al:: see the tutorial on the List Of Charts page, right side, for how we trade the hotline. Then look at the Past Emails to see three years of archived nighly emails. Please note that I only do the Chaos CLinc comments on Fridays. Your suscription gives you acces to all the charts on this site Monday-Thursday. Sign up for the free Weekly email on Moneytide.com to get the email for the free Friday session. 5/2/2008 11:35:58 AM Mountain b:: Hotline trades? Is that a service that you offer? 5/2/2008 11:01:28 AM Mountain b:: In the clinic, the chart will disappear when updating and comes back to a white box with a red x in it. I get that often. Is there a way to correct it? 5/2/2008 9:01:07 AM Mountain TG:: Pretty sure Al had a typo in last comment. 8:15-16:15 EST is usually what his timeframe is set at. 5/2/2008 8:21:58 AM Mountain jb:: I believe Al is using a 3 min chart. His 20 min XMA is 7 bar XMA on the 3 min and the 110 is a 36 bar XMA. 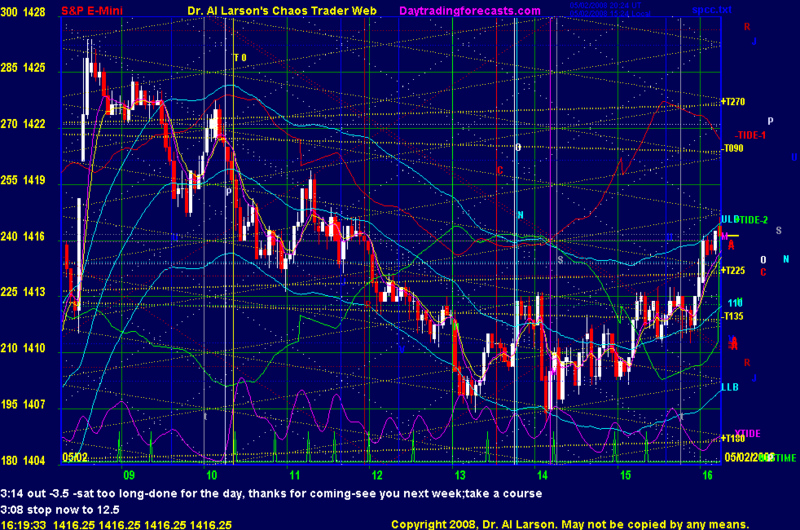 5/2/2008 8:17:56 AM Mountain gd:: Hello, I'm still confused as to what time frame my chart should be set to? I am currently using a 1 minute chart with the 20 and 110 ma's. But my chart does not resemble Al's chart. What am I doing wrong? Thanks.